﻿ Best Price on Hotel Bayahibe in Bayahibe + Reviews! Hotel Bayahibe is located 5 minutes’ walk from the Bayahibe water springs and 0.6 mi from Bayahibe Beach. It features free Wi-Fi in public areas and a lounge area with wooden ceiling. 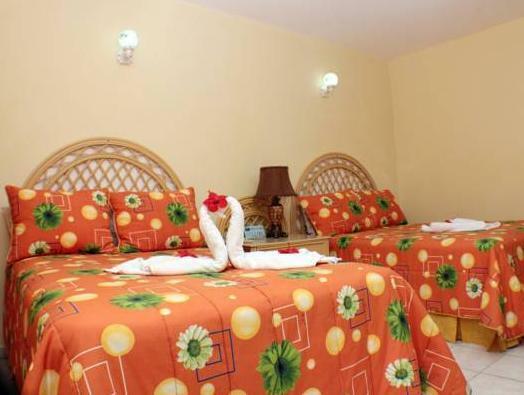 The air-conditioned rooms have minimal-style décor, telephone, fridge and TV. The bathrooms are private and come with shower. Doña Clara Restaurant serves daily breakfast and dinner, and offers panoramic views. There is an extensive menu with seafood and specialized dishes. Hotel Bayahibe also has laundry service and can arrange tours to Saona Island, 20 minutes’ boat ride away. Altos de Chavon Mediterranean Village is 30 minutes’ drive away and La Romana Town Center is 16 mi away. La Romana International Airport is 15 minutes’ drive from Hotel Bayahibe.